Escaping the heat is key. This time of year most days are in the 80s or 90s. Not exactly a heat wave, but I am feeling the heat. A few years ago, the kids and I would escape the heat spending long afternoons at the pool for entertainment. My husband would join us as his schedule allowed (he’s an educator and works some days each summer). This year is different. My husband is working more days this summer (he’s now a school administrator), I’ve taken on more work, and even my three children are busy. My oldest child and middle child are each working a summer job. My middle child and youngest child have twice daily swim practices. My oldest child works out regularly at the health club. With all that we having going on, we don’t have time for lounging by the pool. We’re busy. In fact, this is the Summer of Busy. Another box? O.K., now I am intrigued! With all of us working or exercising, we are home less. When we are home, we love being at home. We play video games. We watch movies. We find entertainment we love. We gather for meals at the kitchen table. More often than not, though, we eat dinner in front of the TV. I know, I know, like you I said I would never let the kids eat in front of the TV. My family had a TV in the kitchen! But we are all so tired from the heat and driving and working that relaxing in front of the TV is just what we need. These relaxing evenings of watching TV with my family are a welcome respite from Our Summer of Busy. Our introduction to Verizon FiOS® Custom TV couldn’t have come at a better time. A few months ago, I was asked to review Verizon FiOS® Custom TV and we have loved every minute of experiencing Verizon FiOS® Custom TV. My family and I have thoroughly enjoyed “test driving” all that is Verizon FiOS® Custom TV. Our Summer of Busy is tempered by Evenings of Relaxation! Look at all these goodies!!! As if Verizon FiOS® Custom TV wasn’t good enough, I was absolutely stunned when I opened a large package from Verizon. The box was heavy. I had no idea what it could be. I opened it. 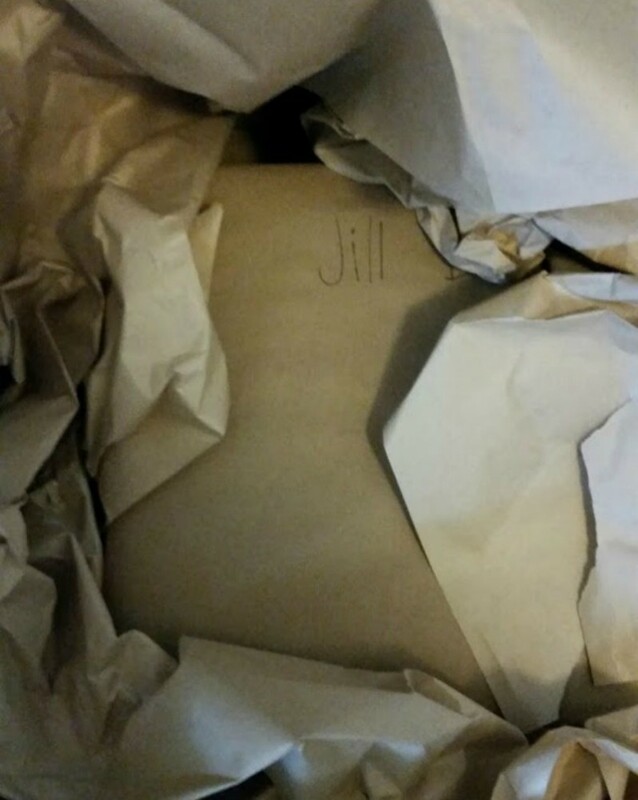 I unpacked wads of brown paper from the box and found a box wrapped in brown paper. The wrapped box had my name on it. Intriguing! What ever could it be? I ripped open the brown paper. I couldn’t help myself. I found a large box with a silver paper sleeve. 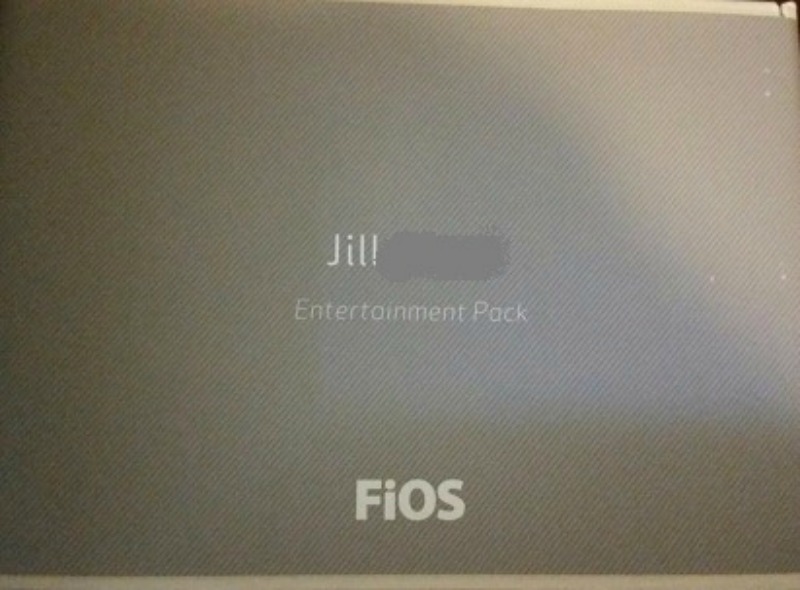 The silver paper sleeve was labeled with my name and said “Entertainment Pack.” It was from Verizon FiOS® Custom TV. Awww, what a sweet note! My family wasn’t open. Usually I wait until the kids are home to open a big box. As kids of blogger, they love opening big boxes. I’ll admit that I was too curious to wait for the kids to get home. I ripped in to that box like a kid on Christmas morning! Inside the box was the most spectacular array of gifts I have ever seen. 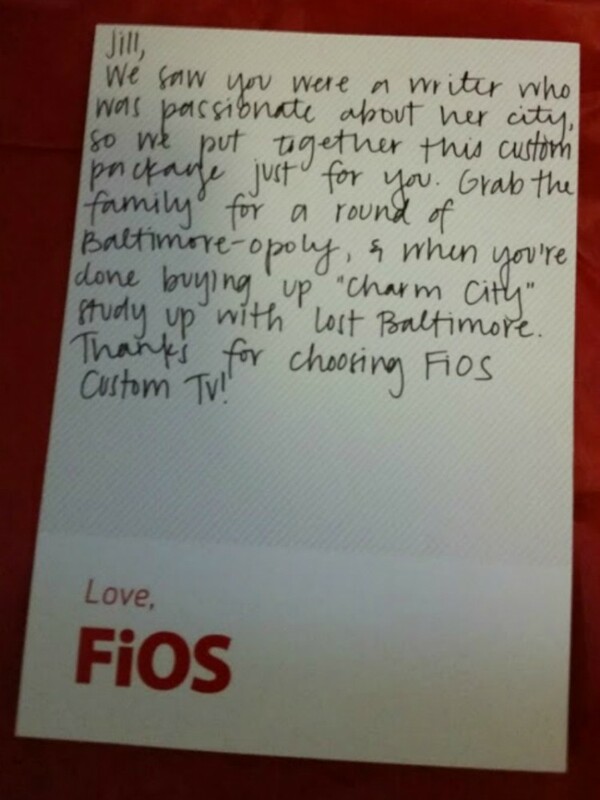 I was amazed at the generosity of Verizon FiOS® Custom TV to their bloggers. 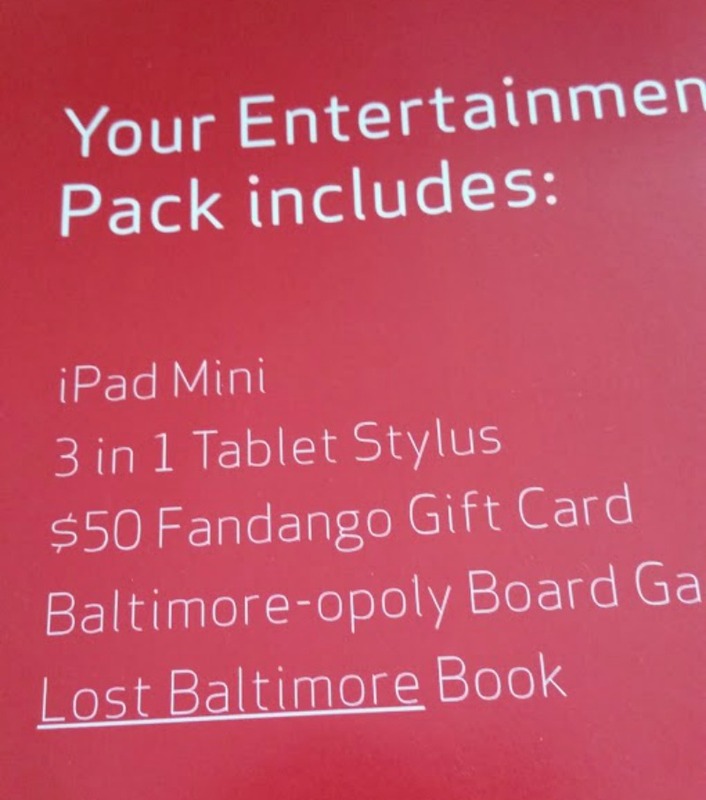 I received an iPad Mini, a 3 in 1 Tablet Stylus, a $50 Fandango Gift Card, a Baltimore-opoly Board Game, and book called Lost Baltimore. So generous! So awesome! Thanks Verizon FiOS® Custom TV!! I love that Verizon FiOS® Custom TV gave me this great tech pack with items that fit me and my individual lifestyle. Like Verizon FiOS® Custom TV, you are able to choose channel packs that fit your customizable viewing preferences and lifestyle. With cable, you can’t do this. You can enjoy more of what you and your family want to watch thanks to Verizon FiOS® Custom TV! Once my husband and kids returned home from work and swim practice, I wasted no time distributing my Verizon FiOS® Custom TV bounty to them. I gifted my husband the iPad Mini and the 3 in 1 Tablet Stylus. He’s never had a tablet and was about to go to Las Vegas for a conference. The iPad mini came in handy when he took notes at conference sessions. 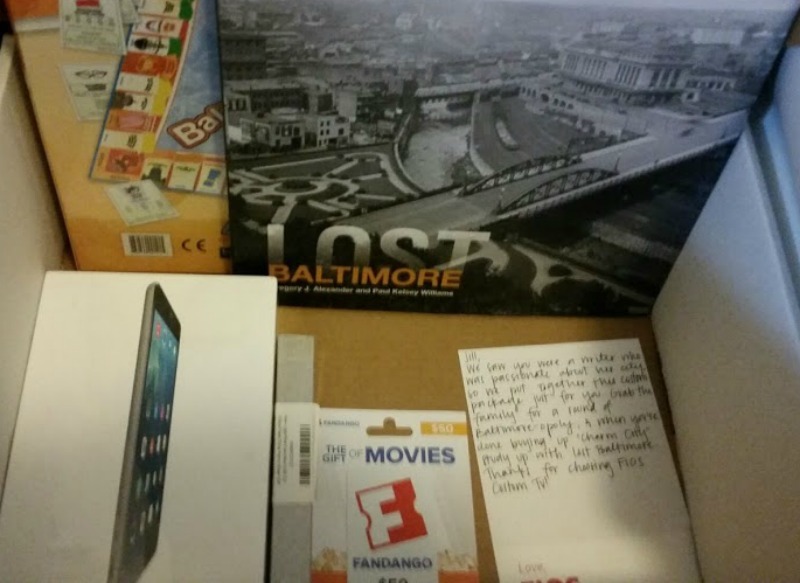 I gave my son the $50 Fandango Gift Card. We used the gift card to pay for movie tickets at his birthday party. I gave my teens the Baltimore-opoly Board Game to take the beach for our family vacation. I gave my mother the Lost Baltimore book…she loves history. When she reads it, she’ll pass it back to me as she doesn’t like clutter! With Verizon FiOS® Custom TV you get more of what you want, less of what you don’t. You don’t get that with cable. You choose and pay for only the Channel Packs that fit your viewing preferences. You get a simplified entertainment experience allowing more time watching what you want. You can customize other areas of your life. Why shouldn’t you customize your TV experience with Verizon FiOS® Custom TV? Customers choose at least two Channel Packs out of a choice of seven. Customers can choose two from these seven Channel Packs: Kids, Pop Culture, Lifestyle. Entertainment. News & Info, Sports Plus, and Sports. If the customer chooses to add additional channel packs beyond the first two, they are just $10 each. Don’t forget to connect to Verizon on social media! Like Verizon FiOS on Facebook.